Editor/Author Skrabec, Jr., Quentin R.
The United States has fairly recently experienced the worst economic downturn since the Great Depression. But crippling financial crises are hardly unusual: economic emergencies have occurred throughout American history and can be seen as a cyclical and "normal" (if undesirable) aspect of an economic system. 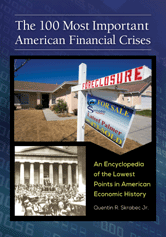 This encyclopedia supplies objective, accessible, and interesting entries on major U.S. financial crises from the Colonial era to today that have had tremendous domestic impact-and in many cases, global impact as well.